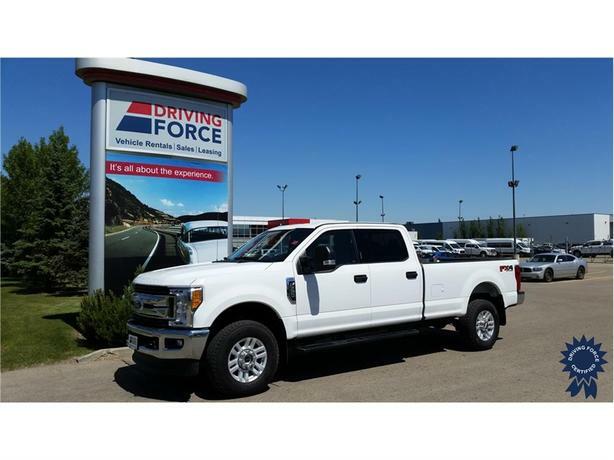 This 2017 Ford F-350 Super Duty XLT FX4 6 Passenger 4X4 8-Foot Long Box Truck comes with a 176-inch wheelbase, electronic-locking with 3.73 axle ratio, 18-inch spark silver painted cast aluminum wheels, TorqShift 6-speed automatic transmission with over-drive, FX4 Off-Road Package, seating for up to six passengers, extra heavy-duty 200-amp alternator, transfer case and fuel tank skid plates, fixed rear-window with defrost, tailgate step and handle with tailgate assist, black platform running boards, fog lamps, SYNC 3 Communications and Entertainment System, 8-way power driver seat with adjustable lumbar, reverse sensing system, six upfitter switches, 110V/400W outlet, power-adjustable gas and brake pedals, HD shock absorbers, front anti-roll bar, Class V towing with harness, hitch, brake controller and trailer sway control, block heater, part-time four-wheel drive, firm suspension, hydraulic power-assist steering, single stainless steel exhaust, auto locking hubs, front suspension with coil springs, leaf rear suspension with leaf springs, full-size spare tire stored underbody with crankdown, black door handles, privacy glass, black grille with chrome accents, perimeter/approach lights, tire specific low tire pressure warning system, and backup camera. The GVWR rating is 11,500 lbs (5,216 kgs) and a 3,800 lbs Maximum Payload. The 6.2-litre V8 gas engine provides 385 horsepower at 5,750 RPM and 430 lb-ft of torque at 3,800 RPM. Experience the difference you will only find at DRIVING FORCE. Message us with any questions you may have.